The 2nd Peter Cubbies Knows, Who Is A Pearl At Heart! Last week, without having any concrete plans on where to go and what to do on a weekend, The Travelling Teddies wandered their paws around town searching for a spot to stop, slouch and snack because it had been a terribly tiring week at work. We were lucky to have made it to City Hall for a cup of coffee, cakes and snacks, for we were greeted by an intriguing "art" exhibition that was being showcased at the Basement level of Raffles City Shopping Mall. So after the light meal, we pawwed our way over to the exhibition (which was free of course...) and looked around. My my my! 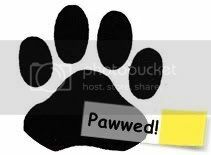 What a PAWWING experience it was! The exhibition was put up by Singapore's Peter Zhou aka Peter Draw - who's main mission is to help the handicapped and less fortunate children with his passion and love for drawing. Isn't that just wonderful??? Meebops was in particular very fascinated by this kiddo's art piece - from Myanmmar (Burma). According to her, this is by far, the most scenic and most beautiful painting of all that was featured at the exhibition. I'll say!!! Before we left, the organisers asked if we would like to contribute to this wall. We were supposed to write, draw or scribble anything that MAKES US HAPPY and share it with the World! And that's exactly what we did! We thought about what makes us happy (there are A LOT!) and we jot it down on nice colourful post-it notes and put them up for all to see. And finally, a word of encouragement to the man who started this good cause... Peter Draw! We are quite sure the little symbol we drew at the bottom right corner of the page was meant to look like a pawprint... Meebops' paw turned out like Tiara and Cubbies'... well Cubbies' paw almost screamed obscene... He! He! The Travelling Teddies has PAWWED! SO... What's GOOD? He is! Yup, its as simple as that. Peter is a child prodigy in the art of cartooning. Having picked up his first pencil (I would think kids at that age picks up pencils!) at a tender age of 3, Peter never looked back since! His main aim is to help kids in Asia who are less fortunate and raising funds for charity through his craft. Isn't that the coolest??????? TTT thinks it is always a COOL thing to help the poor, the needy and the less fortunate! Be it the young or the older folks! Way to go Peter! What's NOT so cool? That we don't know much about Peter Draw and his noble efforts and that we need MORE of such civic conscious samaritans in Singapore and around the world. Then perhaps, this world will be a better place for all to live in. Apart from that, nothing about doing the good and right thing is uncool! What's Red and Roaring All Over? Singaporeans Of Course! It is exactly one-week since TTT attended a birthday bash - this time in celebration of Singapore's 43rd birthday. And the invite, though unexpected, came with perfect timing! Totally unplanned... and because of that, we were thrilled! For your information, TTT were on a lil' holiday. But this lil' holiday was done right at home (The Travelling Teddies are fond of doing this whenever we don't get a chance to leave the country!). It sorta gives us a sense of a holiday-feel to it... be in the spirit of things! There is a story behind this "local holiday" of ours. To begin with, yours truly (the "patriotic" Meebops) could not "bear" (cough cough...hyperventilate...ahem ahem) to leave our little red dot on her country's birthday (for obvious reasons of course!). And since the Little Red Dot alias The Lion City alias Singapore is a small condensed island (as a matter of fact, its only 643 square kilometers) with no neighbouring town, city or suburb within the country to visit - What most of us will do is to make do with the world-class resort and hotels available locally, so we can buy the idea of staying at home, "away from home"! And to cut story short, TTT bought into that very illusion of "home away from home" by booking a room at the Swissotel The Stamford. But the sweetest part about the deal was that this stay was FREE! Completely FOC! Why? Because we were unfortunately short-changed when we stayed at the hotel last year during the New Year celebrations. So this time round, our stay was "on the house"...! Sweet! This is the view of the city from our room. Pretty neat eh? Can you see "The Singapore Eye" watching you in the distant background??? And another view of the iconic and dearly beloved king of king fruits - The "Durian" Esplanade Theatre! Ok back to the birthday story. Unfortunately, we could not get tickets to watch the actual Parade at the floating platform in Marina Bay. Instead, we were offered 2 tickets to participate at the Young NTUC celebration at the Padang. Now we did ponder through our options. It was a tough decision between 1) Joining our fellow Singaporeans at the Padang OR 2) Hibernating in our newly renovated double-balcony "cave" while we occasionally sneak a peek the party that's racking up 21 floors below. The latter was definitely by far, the most attractive, where we can enjoy the fireworks lit up the dark skies, with the TV (showing live telecast of the parade) blasting in the background - sipping our "home-made" Pina Coladas... Heavenly! But... we didn't know how else to spend the day anyway so we thought, well, better than spending the evening cooped up in the room. We might as well join in the party!!! People people and MORE people! And with much spirit, enthusiasm, "patriotism" charmed by the Reddies around us (with almost everyone you see at the City Hall dressed in Red and White, which by the way, are Singapore's national colours) - TTT were honestly quite excited to be a part of over 12,000 eager Singaporeans at the Padang! CBD skyline at dusk... I must admit, it was pretty magnificent! NDP 08 marked not only the RSAF Black Knights' inaugural performance at an NDP , but also their very first time performing over the Marina Bay Area! Best part is, TTT was there to witness it! More pictures of the Black Knight! Swooooooosh!!! Wave Wave!!!!! Helis can you SEEEEEE me!!!!! Of course, the star attraction for the evening were the fireworks that lit up the night sky! It wasn't as spectacular as we expected but it was a feat in itself! Singaporeans are suckers for fireworks... In fact, i think we have possibly the greatest and "most-est" fireworks display on earth! Hehe! Look at the way it exploded! All that lollipop waving, hitting, shoving and parading has finally come to this... A giant Singapore flag at the Padang! Nice! The TTT knocked out immediately after filling up our tummy with junk (which we sometimes do when we're tired...)... with the TV blasting in the background. Meebops recently got me a new "kitty" bank to save my loose change (of 1 dollars and 50 cents only) and it has been my best friend since. Apart from drilling into my spendthrift little lifestyle and start SAVING FOR MY FUTURE, it is also a good way to gather and store away some moolahs to use as "shopping spares" in our bid to rule the world with our own little adventures! Isn't my meebops wise? Why I think she always is! I have emptied my first batch of savings from KM. Yes i have filled it up nice and full! (Check out Mentel's tummy!) And in total, I have saved $95 for the entire month of July, which by my standard is a stark improvement from my absolutely zero savings. And now, i am on my way towards emptying the proceeds from my August savings! Way cool! Another view of $2, $1 and $0.50 from KM... Bottoms up!!! That's a small part of my workstation, including what you may find every morning... my dose of morning black, my Starbucks coffee cup, and... My Money!!! Ha ha! I tell you something interesting... Towards the end of our trip to Cambodia in June, I was feeling quite miserable and down about coming home. Everytime we get a chance to leave or go on our many overseas adventures, i hated the idea of returning and having to get myself adjusted again and again for work, and enduring long painful days of doing the same old bearish routine. I hate to see the same faces at work, i hate having to take the train down to work - the same stale air that i breathe in... I hated it all (well, except the obvious of course...) And even as a Cubbie, i am jaded of the same old tricks and dirty politics. I wanted something fresh! Something exciting! And something more psychologically stimulating! You know, you get these when you travel - often to different places or countries - something new to you... Something you wish you can take home with you. But meebops, as always, had a few kind words for me in the effort to live my spirits high. What a wonderful thought! Indeed! That really did made me feel all better and smiley; a good enough reason to come home ... To Raise Funds! As destiny puts it, my Kuching Mentel (or Cheeky Cat in Bearish English!) definitely came at the right time and now acting as a financial boon to me, especially during times of need! Its Kammuri in Hong Kong... NOT Cubbies!! I was scheduled to travel to Hong Kong again early in August for work but nearer to the actual day, a "human" colleague of mine asked if she could fill in this trip for me (mainly because she wanted to see Hong Kong for the first time! ), which of course, i agreed. Apart from my compassion towards another being (a noble bear-trait...), its also because i've been really busy with work on site and having just recovered from my rigorous and strenuous regime of travelling to, from and within the region, i embraced the offer wholeheartedly. 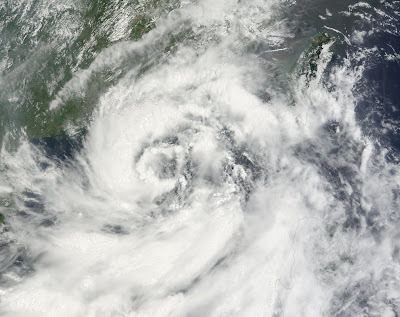 Well well well... it hadn't been a smooth sailing affair for the "human" after all, when just hours before the scheduled flight, a severe tropical storm affectionately named "Kammuri" was issued by the Hong Kong Observatory. 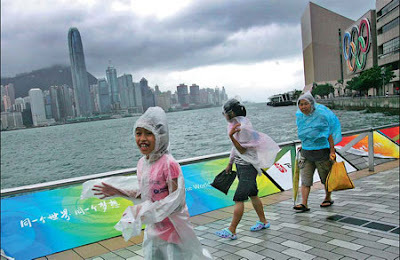 You know, i proud on the fact that if there is one place on earth ready for turbulent stormy weather any time of the year, its Hong Kong. I mean, their warning and signal systems are efficient and extensive - covering all corners of wind directions and the depth of every drop of rainfall and thunderstorms. All you need to do is turn on the TV and follow the instructions, like a freshly printed manual out of a box. 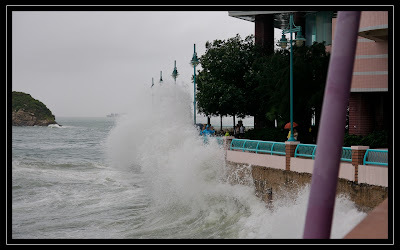 And even though i would give up anything to be in Hong Kong during the typhoon (just to experience what its like), i can't bear to think about how it feels when you have a major turbulence in the plane, as it battle against the stormy weather and super strong winds! Like... YIKES!!! I hate air turbulence! I hate air turbulence anytime, everytime! 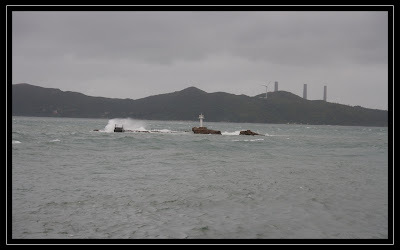 Moving forward, on the morning of 6th August (THE day in which "human" is scheduled to fly) the HKO issued Storm Signal No.8. Now, T-Storm No. 8 is just few steps behind no. 9 and no. 10 (duh...) which is really, one of the more serious, severe cyclone warning in HK. The impact of Kammuri was felt strongly and most public transport services there were halted during the storm. The Airport Authority cancelled and delayed a total of 380 flights to and from Hong Kong that day! I don't even need to talk about Ferry Services! Yup, it was that serious! And from the comforts of my back-straining office chair, i was glued to the computer screen with hourly weather conditions on how the storm was progressing and providing text updates to my "human" friend, while religiously pounding the phone with my fat little paws (wasn't very comfortable by the way...). Below is a wonderful shot taken by China Daily, of the T-Storm in Hong Kong, with the official Five Olympic Rings canvassing the otherwise grey skies. Kiddo in pink tees must be very happy that she's on camera! Just for your visual pleasure, this is what Typhoon Kammuri looks like from the satellite (which i have conveniently used it as my PC wallpaper at work, just to get in the mood of things!) What a vicious sight to see! Here are more photos which i borrowed (and promised to make a reference to...) from a fellow Flickr! member, Marco Veringa. He must be very passionate in what he does, having braved through the storm just to get a few snapshots of the sea conditions at the bay. Something i don't think i can ever do, or even allowed to do in this weather! I don't know where this was taken from but it sure looked like the view i had from Telegraph Bay; one that can be clearly seen from my room at the Le Meridien Cyberport back in April. How can i tell? The single wind turbine perched on a hill! 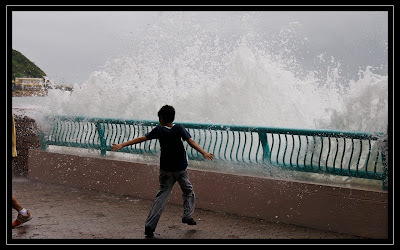 Clearly, all the precautions of a T-Storm 8 didn't get through this kiddo's cheerful, playful, optimistic whatchamacallit nature, as he dares the tides to a ... go on... hit me... sequence... Sheesh! Of course, more than anything, I am definitely very concerned for the safety of my "human" friend but i didn't know how serious this was until i found out the impact it had caused on the lives of those affected, outside of Hong Kong. 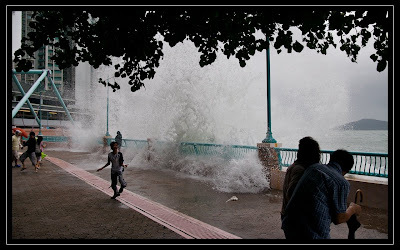 The positive side of it all was that the eye of the typhoon had decided to give Hong Kong a miss this year. And lucky for the "human", after 15 hours of being stranded, she made it to the hotel at 6:50am on Thursday, 7 August 2008 ... and ready for work at 7:30am. The Red Piano? No! Its The Red Shop! SO... What's GOOD? Cheap Cheap Cheap products that are comparable in quality (to those found in regular shops at the Old Market). For example, Meebops got me the famous "skulls landmine" t-shirt for mere US$2! And Meebops didn't need to haggle at all! (which was great because i was running out of paper-bags to hide my face in embarrassment!) But the best part was, at least half of the proceeds from the sales goes to the under-privileged, needy and the orphanage. Isn't that the coolest??? Since we LOVE to shop, why not shop, For A Good Cause! What's NOT so cool? When your conscience is clear, nothing is bad!... Oh, except for the Mosquitoes buzzing around my tiny little feet while i waited for Meebops to shop. Bah! NOT COOL!